University Dental Associates continues to promote their mission of supporting the dental profession. 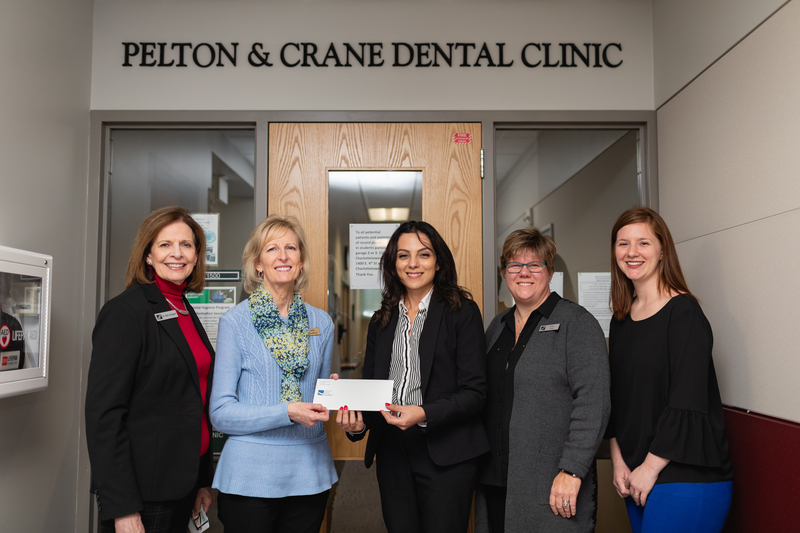 Their latest university partnership for scholarship funding was with Central Piedmont Community College for their Dental Hygiene program. On campus to present the check included (from left to right) Ruth Hedgpeth, Dean of Nursing, Allied Health & Human Services; Judy Qualtieri, Dental Hygiene Program Chair; Dr. Chegini, Dentist at UDA Matthews; Lisa List, Health Sciences Division Director; and Terri Johnston, UDA Hygiene Mentor. The scholarship funds will go towards funding the education for Dental Hygiene Students who attend the program. Central Piedmont Community College (CPCC) has served the Charlotte community for more than 50 years. In addition to Charlotte, there are more than six campuses currently distributed throughout Mecklenburg County. The Hygiene program at CPCC has had a 90% graduation rate for the past 3 years, and a 100% pass rate on the Dental Hygiene National Board for the past 6 years.